MAURICE RIVER – Port Elizabeth United Methodist Church, 152 Port Elizabeth-Cumberland Road, welcomes all to its “Surf Shack – Catch the Wave of God’s Amazing Love” Vacation Bible School…Lessons are especially suited to the 2-12-year-old age group, but infants, teenagers and adults are guaranteed to have a good time! Activities are free from 6 to 8 p.m., Monday thru Friday, July 18-22, in John Boggs Hall, Please arrive at 5:45 to sign in. Watch a nightly continuing adventure video, sing and dance, do science experiments, create a shell bracelet, giant sun glasses, a crab headband, sun catcher, and wind chimes; and play outdoor games. Dinner included. For more info, call (856) 825-4386 or visit our Facebook Page. This entry was posted in Events, Music, Port Elizabeth UMC, Publicity, Religious Education, Vacation Bible School, Web Presence and tagged Cokesbury, Surf Shack on June 29, 2016 by portelizabethnjumc. 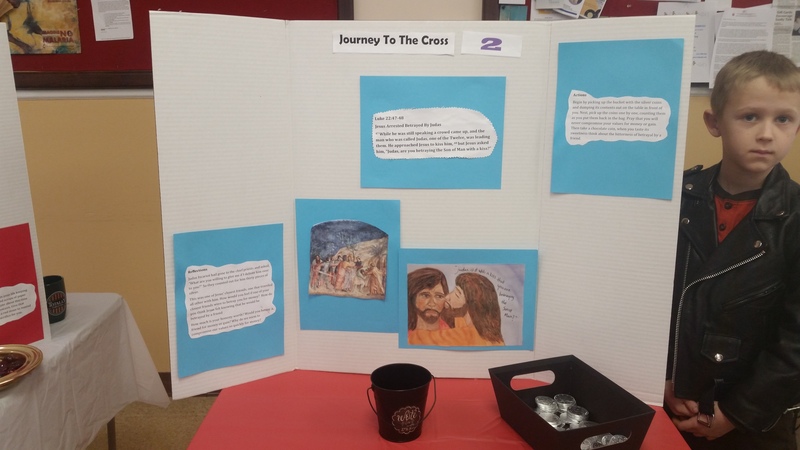 The project “Journey to the Cross” was organized by Lou Hyson our Sunday School Superintendent in 2015. 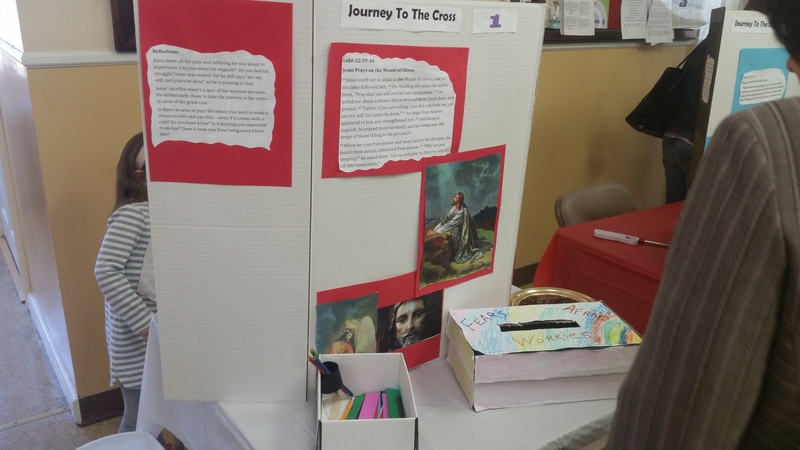 For many weeks, the Sunday School Students created each of the stations on three-fold displays. On Palm Sunday after Church, all of us went to the John Boggs Hall to see the Stations of the Cross along two walls of the room. 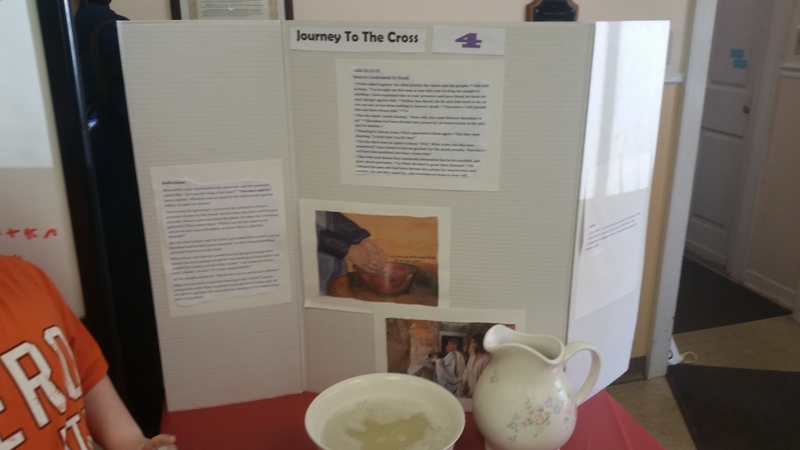 The Sunday School Students at each of the stations taught the adults what Jesus went through. Each station consisted of a reflection, a passage from the Bible, and an action or actions to take. It was a very moving experience involving all senses, along with your mind, heart, soul and spirit. 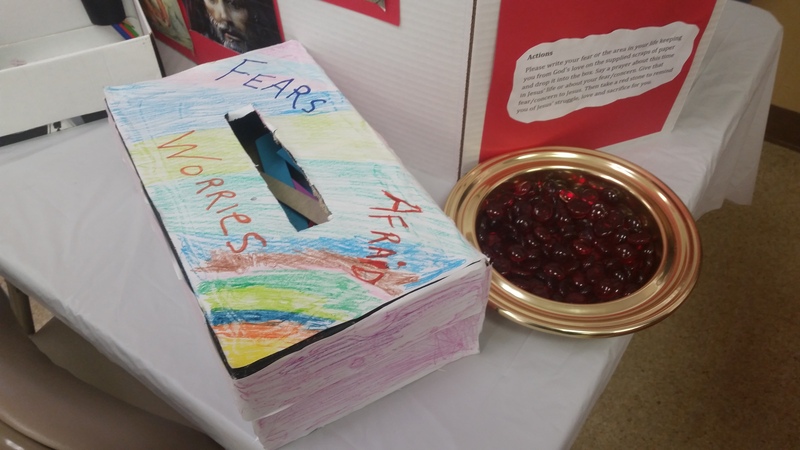 We reflected on the suffering Jesus was about to experience, sensing His anguish and struggle. Jesus says to God, “Your will be done.” He chose to go to the cross. Is there an area of your life where you need to make a choice to love and sacrifice – even if it comes with a cost? Write your fear or the area of your life keeping you from God’s love. Take a red stone to remind you of Jesus’ struggle, love and sacrifice for you. Reflect that Judas Iscariot betrayed Jesus for 30 pieces of silver. How would you feel if one of your closest friends? How much is your honesty worth? Would you betray a friend for money or gain? The action was to pick up a bucket of coins, count them as you put them back. Pray that you will never compromise your values for money or gain. Take a chololate coin, when you taste its sweetness think about the bitterness of betrayla by a friend. Reflect on being a Christian and acknowledging Jesus in word and in your actions. This will help others who do not know him. The action was to wash your hands. 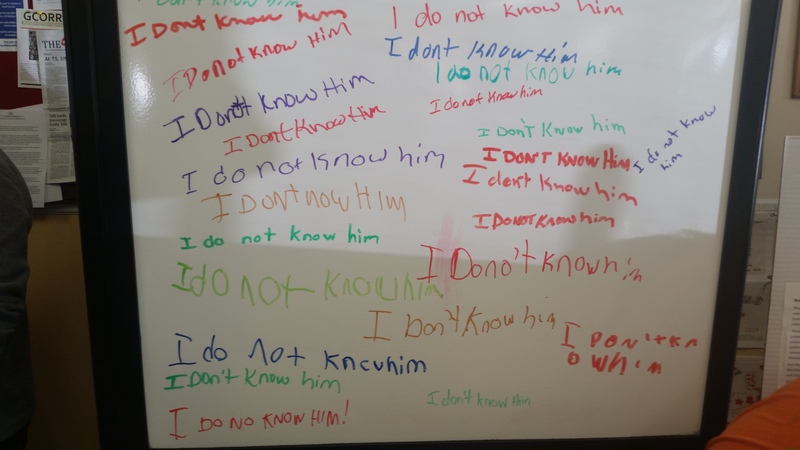 Action was to write with a red marker and a piece of paper. This symbolized the blood Jesus shed. Contemplate the wood of the life size cross and image how heavy that is. Jesus carried that for YOU and for ME! On the cross shaped paper, write a word of sorrow, a word of gratitude and a word of hope. Tape it to Jesus’ cross. Between the emotional draining of prayer at Gethsemane, then being beaten, and carrying a heavy cross. Jesus fell. How could Jesus enter our lives without surrendering to the crushing weight of the life on all on earth. The action was to move Jesus along a path. Video to follow. The Cross is a reminder that there are many times we must depend on others with humility. We must depend on Jesus. Jesus was not looking for sympathy. He was looking for surrender. The action was to take a hammer and drive in one nail. The nail here was way smaller than the nails driven into Jesus. Three men were being crucified. One was sarcastically calling for salvation. One defended Jesus as an innocent victim. Jesus wanted his mother Mary to be taken care of. Reflection light a candle, because that pierces the darkness. But on the third day, JESUS ROSE FROM THE DEAD. HE IS ALIVE!!! This entry was posted in Events, Liturgy, Port Elizabeth UMC, Prayer, Religious Education, Sunday School and tagged Christian, Crucified, Good Friday, Holy Week, Jesus Christ, Palm Sunday, Stations of the Cross on March 25, 2016 by portelizabethnjumc.